Members of the youth leadership team discuss water quality with Dr. Heather Patisaul. Photo by Kathryn Fromson. More than half of your body is water, and we all know how important it is to drink water for your body’s health. But how healthy is the water you drink every day? What chemicals and microorganisms are lurking in it, how can they impact your health, and how are they regulated? 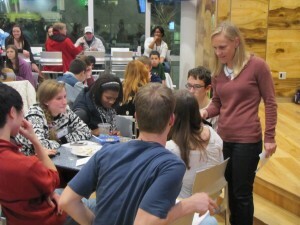 At our January 4, 2013 Open Minds Café in Raleigh, NC, Dr. Heather Patisaul from the Department of Biology at North Carolina State University talked to teens about water quality and the impact your water consumption choices can have on the environment. Dr. Patisaul’s lab studies endocrine disrupters, one of which is bisphenol-A (BPA), a chemical present in many plastics. One of the biggest ways that BPA gets into our bodies is through leaching from plastic food and liquid containers, which is how Dr. Patisaul became interested in water quality. Through her presentation, teens in attendance learned about the potential contaminants present in water, the regulations on contaminant levels in bottled, municipal, and well water, and the options they have to reduce waste and reduce their exposure to endocrine disrupters like BPA through the use of BPA-free reusable containers. Dr. Patisaul relied heavily on audience questions and answers throughout her talk and encouraged discussion of new ideas. For the hands-on portion, Dr. Patisaul did two blind taste tests with the audience to show the difference between different H2O sources and different containers. The first test asked audience members to try a sample each of bottled, well, and municipal water, then rank which one they thought tasted the best. We collected the results and to the surprise of the audience, the bottled water ranked the lowest in terms of taste! This did not surprise Dr. Patisaul, who had done tests like this before, and it helped her make her point that bottled water is not as “good” as everyone seems to think it is. A similar taste test was done with samples of orange Gatorade that had been kept overnight in a plastic, glass, or aluminum container, and audience rankings were recorded for these too. These results allowed Dr. Patisaul to introduce her audience to the different options for liquid containers and for the audience to discuss the pros and cons of each (glass is non-reactive but easily broken, while aluminum is sturdy but can make juice taste funny!). Video of Dr. Patisaul’s Open Minds Cafe – Livestream video produced by the NC Museum of Natural Sciences, with all presentation slides by Dr. Heather Patisaul.